Sometimes you can’t prepare and eat a healthy meal. Either because you are too busy and ain’t getting time for anything or you are late for work in the morning. Or simply you are not in the mood to cook. It can happen, right? At such times, ready to eat meals come to your rescue. When you are trying to get fit, you cant simply eat anything. So you need to have some healthy options prepared for yourselves. It should not happen that you are hungry, but you don’t have anything healthy to eat. Given how hard it is to find healthy snacks, you will simply munch on anything, thinking of it as just a one-time thing. But that one time turns to multiple times soon and sabotage your weight loss goals. Trust me, it happens (happened to me). 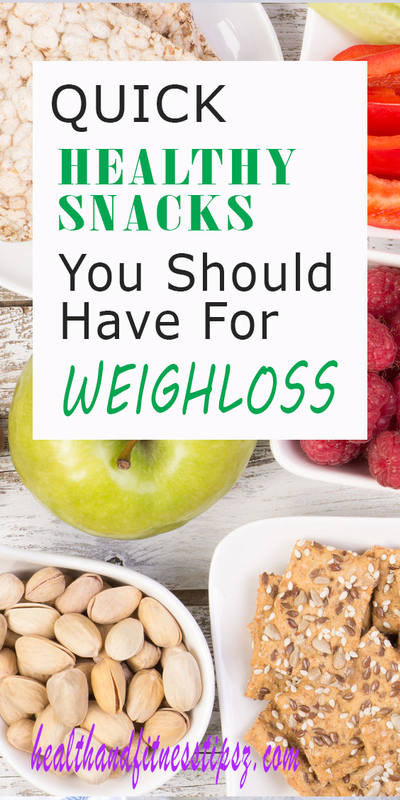 But if you have healthy snacks that taste awesome, then you don’t have to worry about anything. So let’s have a look at the healthy snacks which you should always have at your home to save you during emergencies. This has to be first on the list. The best thing about fruits is that do not require any preparation and can carry them anywhere. You can munch on these anytime. If you feel hungry while working, just grab an apple or any of your favorite fruits. With so many varieties of fruits to choose from, you won’t get bored eating the same fruit again. Fruits also provide your body with nutrients and fibers which will keep you full for longer. They hydrate your body and are low in calories. For all these reasons, fruits are highly beneficial for weight loss and even in general. Seeds and nuts are a great source of proteins, fats, vitamins, fibers, and several minerals. Seeds such as those of pumpkin and nuts such as almonds are a great source of protein and healthy fats. These healthy fats and protein are very important for you if you are on the keto diet. Some seeds and nuts which you can snack on are almonds, walnuts, pumpkin seeds, flax seeds, chia seeds, and cashew nuts. These are high in calories so eat accordingly. Cheese is delicious. I don’t know about you, but I am a great fan of it and can eat it the whole time. Cheese contains a good amount of protein, vitamins and obviously calcium as it is a milk product. Various types of cheese are very low in carbs and high in fat which makes them an important ingredient in various keto recipes. The best varieties of cheese for you are parmesan, feta, cottage, mozzarella and swiss. Yogurt is healthy. Greek yogurt is the best of it! Top your yogurt with granola or fruits such as berries, kiwi, cherries, etc for a quick snack. Berries give a boost of antioxidants to the body. Cherry tomatoes and mozzarella taste good with each other along with being healthy. Tomatoes are low in calories, have certain nutrients and antioxidants, the most important being lycopene which reduces the risk of cancer and heart diseases. Lycopene is beneficial for the skin. Mozzarella, just like other cheese is rich in protein and calcium. 1 ounce of mozzarella paired with 2-3 cherry tomatoes has less than 100 calories and is rich in healthy fats and other nutrients. Milk is one of the simplest foods. All you have to keep is to keep a pack of milk in your refrigerator. Just empty it in a glass and drink! Milk tastes good, but you can add some chocolate syrup for better flavor. I don’t think I need to tell you about the nutritional richness of milk. Its one of the best foods anyone can have. Ranch dip is made using greek yogurt and ranch seasoning mix. Greek yogurt is a sweet snack which is rich in protein. Mixing the ranch seasoning mix in it makes it savory which is the flavor of ranch seasoning mix. You just have to mix the ready ingredients, so it is quick to make. Mix around 2 tablespoon ranch seasoning mix in 1 cup greek yogurt to make the ranch dip. Take 1 cup cucumber or carrot sticks and enjoy it with the dip. I don’t have any idea about how it tastes as I have never eaten it. But I know that it is quick to make snack which will immediately supply some nutrients to your body to keep you working without any problem. Pears have lots of fibers and string cheese is a source of some fats and proteins. Slice a pear and simply eat it with string cheese. Yep! Chips made from the healthy nutritious coconuts. Coconut chips are made by roasting the slices of coconut. Look out for the low sugar or unsweetened ones containing minimum ingredients like this one. Chips are a good snack which can suppress your short-term cravings when you don’t have anything to eat. These aren’t fried, so you don’t need to worry about its nutrition being lost due to frying. Almond butter is nutritious, as it is made from almonds which are very healthy. Owing to its nutty flavor, almond butter tastes goods with apples which are sweet. It is creamy and helps to keep your blood sugar levels in control just like peanut butter. Normal blood sugar levels are important for proper metabolism. Almond butter contains magnesium which boosts heart health. Eating this combo will provide you with some protein and fats from the almond butter, and important fibers and vitamins from the apple. So chop the fruit and enjoy it with almond butter. If not a huge fan of fresh fruits, you can even try the dried ones. The fruits just undergo the process of drying so the water content is lost. The volume of the fruit reduces to around half, but the nutritional value remains the same. Eating a full cup of fresh fruits and eating a half cup of dried fruits basically provides equal nutrients. Dried mangoes, apples and pineapples are some must try ones. Avoid buying the ones that contain sulfites which are used as a preservative. Sulfites can cause unpleasant side effects on your health. You can mix some nuts and seeds with these fruits to get a variety of flavors in the form of trail mix. Slices of low sodium deli turkey with some grapes can help you in boring hungry times or when you just need anything to fill up your stomach when you are getting late. Turkey fulfills your requirement of protein while grapes provide you some additional vitamins and minerals. No doubt oatmeal is healthy and stomach filling. But, plain oatmeal everytime can get boring. Top with fresh berries such as blueberries, strawberries, raspberries and some milk to make it interesting to munch on. These toppings definitely make the meal more tasty along with keeping it healthy. Eggs are full of protein and contain almost every nutrient required by the human body in some amount. Super quick to make, which you can eat every day. Eat it plain, top with freshly grounded black pepper or combine with avocados for a different taste. Avocados are one of the healthiest food on the planet which tastes delicious. Combine it with the goodness of cottage cheese and you have an awesome healthy snack loaded with nutrition ready in no time. Making it is super easy too. Cut the avocado in half and remove its pit. Now, mash the fleshy part of an avocado and mix it with cottage cheese. Add some cayenne pepper or regular pepper for taste. Your healthy snack is ready. If you are running short on time, then just remove the pit from one half of the avocado and add some cottage cheese topped with cayenne pepper or seasonings of your choice. If you like these healthy snacks, then do share the post!